Yes, the Super Bowl was on fire. As one who is very critical of halftime show performances, I cannot deny that Mrs. Carter brought the energy and attention. All of this led to her releasing her tour dates for the Mrs. Carter Show. As excited as I was to actually buy these tickets, despite the fact that I can expect to see a Pepsi logo on everything, something turned me off. 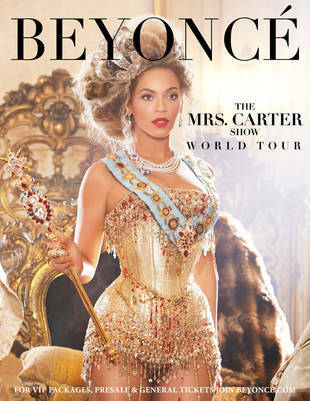 If you haven't seen the photographs for Beyonce's new world tour, you probably wouldn't even recognize her. Go on her official Facebook page or website and you will see an image of what looks like a Victorian white woman in the Elizabethan era. Her (prosthetic) blonde hair puffed and extended to reveal a face that is almost as white as snow. Lips red and her skin powdered. This is not the same bronze Beyonce that I saw rocking the stage in an all female band with her darker Destiny's Child counterparts. I was only left with memories of previous patterns that the multi-Grammy award winning artist had done in previous years in regards to her skin. And I asked myself the question: why, Bey? Let's not act like this is something new. Over the years, it seems as though Beyonce has gotten lighter as she has gotten older. No, this is not genetics and let's not act pretend her skin color in her first Destiny's Child album cover matches that of her latest album 4. Whether it is that highly controversial Revlon advertisement or her own album cover art, Beyonce has consistently been called out on alterations done to her pigments. What does this say about our society for black women? It tells me that in 2013, an independent, confident and successful woman of color still struggles to have the confidence to fully embrace the skin she is in. If one of the most powerful women in entertainment feels she has to lighten her skin for projection, what does that say for the rest of us? Believe it or not, colorism, the stigma associated with skin complexion, has been an ill that has not yet been dissolved by the black community. What was first given to us by slave masters in separating the house slaves from the field ones, has now taken place in how we objectify our women and each other. I cannot begin to count how many rap lyrics point out how fine she is to be a "yellabone" or how, as Kanye put it, "light skin girls and some Kelly Rowlands" to point out how exceptionally attractive dark skin girls have to be to fit the norm of beauty. This is pretty problematic in many ways. It's first of all self-loathing and unnecessary for today's times. The fact that our nation has an African-American first lady with a complexion that isn't on the lighter side of the spectrum, nor does it try to be, shows a compelling advancement in appreciation for all women of color in many ways. Furthermore, the only reason why such stigma in our country continues is contributed to our own behavior that is shaped by the influential people of color around us. It devastated me when I saw that Sammy Sosa had lightened his skin. As successful as he was in a field that was not necessarily fixated on male skin complexion, it saddened me to see him do it. In many ways, it even made me reflect back on the transition of the late great Michael Jackson and what explanations he had for such a more pale white appearance. And why does all of this matter? Because I grew up hearing stories of young dark black girls getting their faces scrubbed with skin lightening soaps out of their free will. Tales of young women being abandon by their mothers because they were too dark. Visions of parents on the Tyra Show saying they will bleach their young black children's skin so that life would be easy for them. If this is the reality that had more implications back in the early 20th century than it does now, please stop it. Stop trying to explain why you are dating the ebony skin girl. Stop making it seem exceptional that a girl of a darker complexion is actually attractive. Celebrities, stop putting extraneous powders and lighteners on your skin: we all know what you used to look like and we still love you. And people of color: let's not continue to perpetuate an oppressive cycle of self-loathing of our appearance and heritage, we have future presidents and movers and shakers that are in our race looking for more because they can do such. If this can be accomplished, then perhaps even in our own race we can truly make our lives not be judged by the color of our skin but by the content of our character.